Apple has expanded iCloud over the years to include more and more services, like iCloud Photo Library, Apple Music, iCloud Drive and iCloud Keychain. 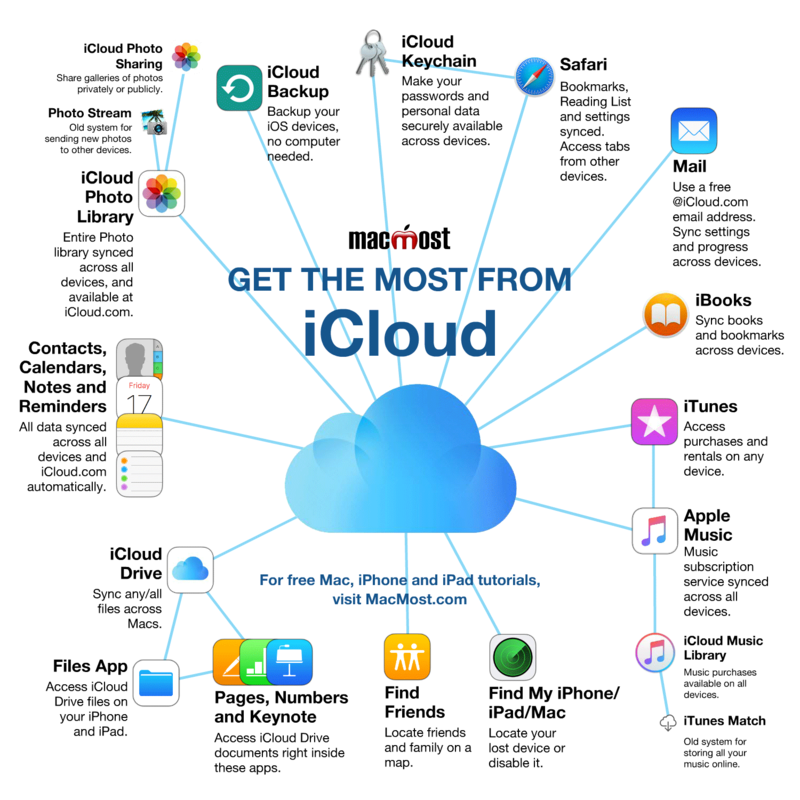 It can be difficult to get your head around everything that makes up iCloud. Here is a handy infographic that ties it all together and explains each service. Click it to view larger, or download it! Thanks Gary, it has been printed and will go up in our Computer Lab. What a help the graphics will be! iTunes Match is referred to as an old system. I only use it for my record collection, and wonder what you mean. I have no use for the Radio-part. Do you think I should find another place for my music? Or what have you in mind, when you refer to the service as old? Jan: If you have Apple Music, you really don’t need iTunes Match. Apple Music will match your music in a similar way. It isn’t exactly the same, but very close. I don’t foresee Apple continuing to offer iTunes Match because of that. Can I use Apple Music as a cloud backup for my music? Just as I can with iTunes Match? Jan: I wouldn’t say that either option is a good “backup.” But it really depends on where the music came from in the first place: iTunes purchases? Ripped CDs? Other download services? If ripped CDs, I would just back up as normal data files. It really depends on that and how irreplaceable the music really is.